On this page, I describe how I got the Novation Launchpad Mini hardware with Ableton Live 9.7 Lite to run on AVLinux. My young son uses this instrument, so I picked his light computer to install the software. Well, the Ableton software should also run on iPADs, so compute performance is probably not really an issue. I used a cheap "ASRock QC5000-ITX/PH" motherboard with 4GB RAM and a "120GB Samsung 850 EVO" SSD. This configuration has a "AMD FT3 Kabini A4-5000" processor, which incorporates a GPU. I picked the AVlinux distribution because it promises low latency. AVlinux uses a Real-Time (RT) kernel, which sacrifies (a little bit of) performance for faster response. Of course, any lagging in processing sound is horrible. Download AVlinux version 2016.8.30 in 64bit. I first tried it as "Live" DVD... but the installed version is soooo much faster! "Live" demo login: username=isotester, password=avl64, root password=avl64admin. Be warned that Real Time Linux kernels are not supported by propretairy AMD and NVIDIA graphics drivers. Gladly, both chipsets got much better support from open source drivers in recent years. AVlinux (based on Debian testing) currently provides a 4.4 kernel. AVlinux is based in Debian testing, which offers an enormous amount of pre-packaged applications. AVlinux installs many very powerful multimedia tools. Some look easier to use than Ableton. The base system is quite small (20GB is more than sufficient). Most additional code will be in your home directory. Be aware that this page is Work-in-Progress: I probably will add more later. You can help me, by contributing the experiences that you have. The last line may be my own mistake during installation. The Ableton software only supports Windows and Mac, so we will run the 32-bit Windows version. We need to limit to 32-bits, because the 64-bit Wine (the Windows runtime on Linux) implementation does not support vc2013 libraries yet. Even when you install 32-bit Wine, there is a function missing in the release contained in Debian testing. We need at least Wine 1.9.5. 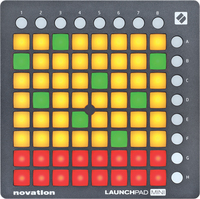 Your Launchpad documentation explains that you have to register at Novation for support. You will also need to register at Ableton to be able to download the "Ableton Live 9" software. You can download about 4GB files, of which 1GB is the core software. wine "c:\users\Public\Application Data\Ableton\Live 9 Lite\Program\Ableton Live 9 Lite.exe"
The first thing you have to do now, is to install your software license. Ableton Live tries to direct you to a browser you do not have, so go for "offline registration". Open your own browser and collect a "Authorize_*.auz" file on disk. Using a graphical file-system browser to drag the auz file into the drop-zone of Ableton Live. It just works! Marvelous! Plugin your device before you start Ableton Live. Open menu "View/Preferences". Set as Control Surface your Launchpad version. I increased the zoom to 150 in Look & Fell. Some websites warn that CPU-multicore should be turned off, because it would cause random stalls. I have set this to single-core for the moment, and may try the multi version once I find that more CPU-time is required. The AVlinux user manual (very extensive!) explains in great detail why and how to configure "Jack" to organize sound transport between applications. I tried many things to get this to work, and they all failed. Then I switched to pulseaudio which did it immediately! Start pavucontrol next to your Ableton Live window and select "internal audio out" if you use a head-phone with jack. You do not need (wish) a ~/.asoundrc configuration. This write-up was made very close after a rather painful installation proces. Above steps are simple, but it took me hours to figure them out (being a very experienced UNIX/Linux sys-admin). I may have missed to things in this write-up, so please help me improving. I'll add some helper scripts as well, soon.